WE were fortunate to run into Daryl Jans from Melbourne the other day at "Mood Food" near Kempton, when he dropped in for a quick bite to eat and a cuppa. Daryl was driving a Prestige Moving 2007 CF75 Daf at the time and towing a bogey removals van and a dog trailer all loaded with gym equipment. They had loaded at Mulgrave and were on their way to deliver same in Hobart having made the crossing to Burnie on the Toll ferry. 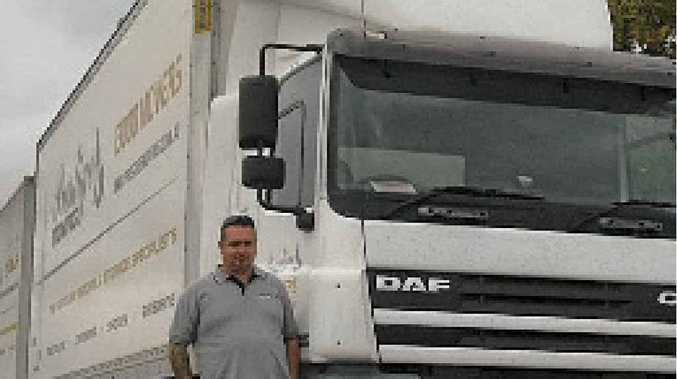 Daryl tells us he has only been with Prestige Moving for three months this time around, but that he had been there previously for three years, and that he finds them an all round good outfit, and says it is a great job, obviously, and that they work nationwide. He was just back from Cairns and said this was his 15th trip to Tasmania, and that suits him fine as he loves Tasmania.